The South Korean president, Moon Jae-in, will seek to salvage stalled nuclear negotiations between North Korea and the US during a summit with Kim Jong-un in Pyongyang on Tuesday that could make or break his legacy. It will be the first trip by a South Korean leader to the North Korean capital in 11 years, after two previous summits between the men this year. Moon’s success will be determined by whether the North Korean leader makes concessions on his nuclear program, and it is his top priority, according to Moon Chung-in, an outspoken South Korean presidential advisor. The South Korean president is also planning to discuss reducing military tensions between the two Koreas, and could secure troop reductions on the heavily militarised border. “President Moon will try to persuade Kim to come up with some bold moves,” Moon Chung-in said at a briefing. If North Korea “comes up with some shocking concessions, and then the US responds boldly, verification could come later. This would build trust that’s lacking between Washington and Pyongyang”. 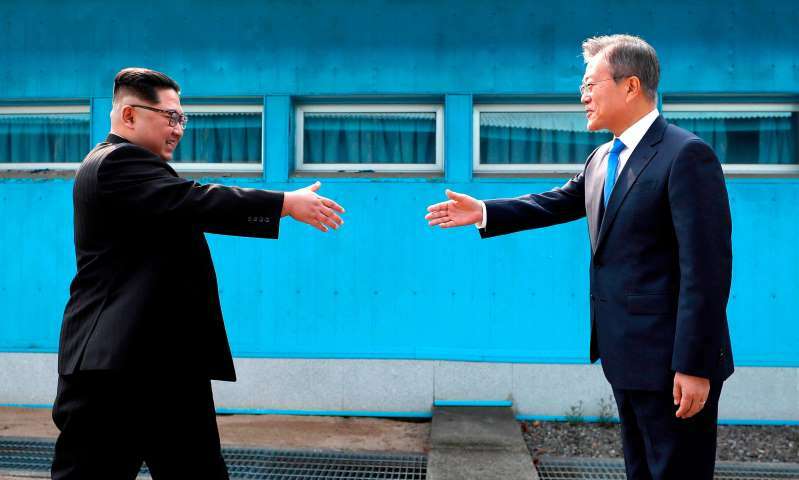 Kim and Moon first met at the border village of Panmunjom in April, where Kim committed to the “complete denuclearisation of the Korean peninsula”, a phrase criticised by experts who say it is too vague. Moon is likely to try to get Kim to commit to more forceful language at the summit in Pyongyang this week. The April meeting eventually led to Kim flying to Singapore in June for a summit with Donald Trump, the first time a sitting US president met with the leader of North Korea. But as the flurry of diplomacy quieted down, there has been little progress in the US goal of North Korea relinquishing its nuclear arsenal. Trump even cancelled a trip by secretary of state Mike Pompeo to Pyongyang for fear it would not yield concrete results. Moon Chung-in admitted there was still “a huge perception gap between Washington and Pyongyang”, where Kim feels he has made concessions and US officials want to see more concrete steps such as shipping nuclear warheads out of North Korea. “Kim Jong-un, I wouldn’t say he’s progressive, but he’s much more open minded and liberal and he knows what’s going on in the outside world,” said Moon Chung-in, who met Kim in April. In the days leading up to the summit, the two Koreas opened a joint liaison office in Kaesong, just across the border in North Korea, to maintain constant communication. Where the two sides previously spoke over telephone and fax lines, about 20 officials from each side will staff the office and speak each day. “We hope that this will also help the progress of denuclearisation talks between North Korea and the United States,” Baik Tae-hyun, South Korea’s unification ministry spokesman, said of the office. But significant gaps remain. Washington has demanded North Korea unilaterally disarm, before negotiations over a proposed peace treaty, formally ending the 1950-53 Korean war, or any sanctions relief is granted. North Korean officials have repeatedly said they have already made concessions, by closing nuclear and rocket test sites, and want incremental concessions from both sides throughout the process. Experts and satellite images suggest North Korea has continued to develop its nuclear program and there has been new construction at its only known nuclear plant. For Moon’s trip to Pyongyang, the best he can likely hope for is improving the situation locally on the Korean peninsula. He is bringing a host of business leaders from South Korean firms, including Samsung, Hyundai Motor, LG and Posco, a steel company, as they prepare for possible investments in the country if sanctions are lifted. Moon has previously tried to encourage Kim to denuclearise by offering economic support.